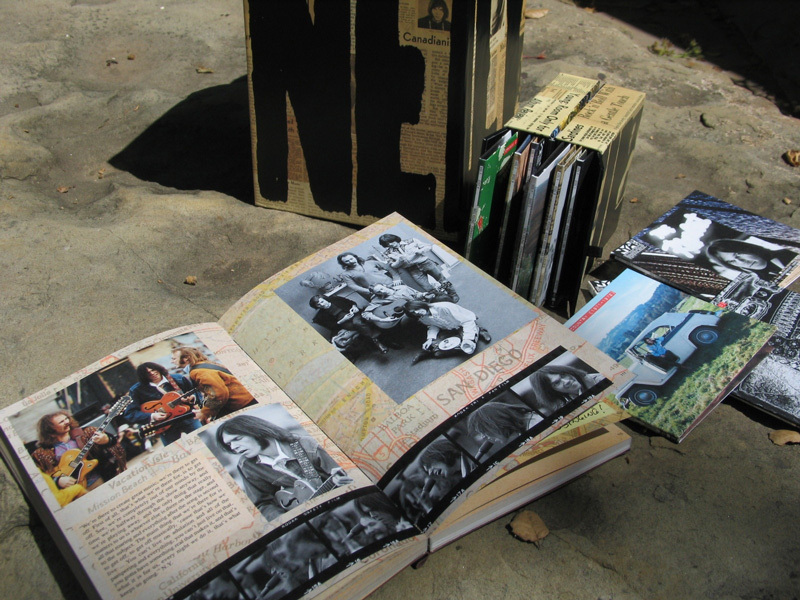 Neil Young Archives Vol. 1: Collaborating | Gary Burden for R. Twerk & Co. It may have been 20 years in the making but it was one of the most enjoyable and collaborative projects I've ever worked on. Neil Young Archives, Vol. 1: 1963-1972 hit stores June 2, 2009. I have been working with Neil on album covers since his release of After the Gold Rush in 1970. I would listen in on Neil's recording sessions, I mean really listen to the music, and most of the time the music will tell me what the design wants to be. I'd present my ideas to Neil, and he'd give me his own ideas and feedback, and we would incorporate both into the album design. Neil is a prolific writer and a has great vision. It's nice to collaborate with someone that doesn't do design, they see beyond the boundaries we put on ourselves and push us further. Often times he would come up with things that I never thought would work -- and they would! For instance, we had the the journal in the Vol. 1 pretty much ready to go, and Neil decided he wanted to have maps in the background of every page. I thought, no way that will work, but it ended up working really, really well. It adds an element of a journey, like walking in Neil's footsteps. Neil doesn't understand the concept of "we can't do that," and his ideas almost always end up being right. It has been and remains a great, always mind expanding trip. Working with Neil has always been a rich collaboration for me. I'm continually learning from him, learning not to accept boundaries, and this has led to a rich friendship. Neil was even the best man at my wedding to Jenice Heo, who is a brilliant painter/artist and she contributed her talents to the box set. Neil had the idea for the Archives 20 years ago, back in 1989. At first, the Archive was going to be all of his work up until 1989, but as we worked with our archivist and gathered more and more material, we realized we would have to break it down into periods. We just had too rich a volume of visual material and music. When we started to think about how to present it,we quickly realized there just wasn't the kind of technology back then to fully implement Neil's vision. We waited for CD's to come out, and then we realized that they wouldn't be what we needed. When DVD's were first introduced, we thought for sure we hit the jackpot, but even that wasn't enough. When Blu-Ray was launched we knew we had what we needed technologically to tell this story. With Blu-Ray, not only do you have high definition video and interactive menus, but you can also access new material as it comes out and archive it, which is great because with that ability the Neil Young Archives is a living, breathing, constantly growing project. It really has a life of its own. We are making a second edition of Vol. I with the new material and updates we've added so far. This box set is unlike anything else. There are about 60 hours of music, the Blue Ray version is customizable, you can go online and add material to your archive. This is a truly organic project that has a life of its own. I can't wait to see what the Volume 2 will hold for us all. Congratulations on another incredibly innovative design ... it must be gratifying to see it nominated for a Grammy! I just received Mohawk Paper's release on this package, which highlights the thought you've given to the environmental dimensions of the entire project. This has been a hallmark of your work for decades, & few designers can say that. Some years ago I had the pleasure of writing an article about your Greendale project for a magazine I edited called Dynamic Graphics. When we spoke at that time, you told me about receiving a letter informing you that Richard Pryor's first album was nominated for a Grammy ... & that on the same day you got a letter from National Geographic's editors objecting to the clever visual commentary you used in that groundbreaking & controversial cover. It is still one of the most trenchant, witty & thought-provoking LP cover designs of all time! Incidentally, I am a good friend of the gifted & dynamic Pam Williams of Williams & House, a household of wonderful people ... I understand you have worked with them. AND I will soon be taking on the editor's role at Mohawk's site http://www.FeltandWire.com. Just wanted to express my wonder & regard for your work, reintroduce myself & say I hope we can work together again soon. I just saw the bit you did with Henry Diltz and it was great. Are you still designing CD covers or has the value if the art been lost on the size of the package? If possible, could you discuss the writing Neil uses on his records... It appears to me that many of the early lyrics were done by hand. Today it appears you have a computerized font that has replaced his own writing. Please share the history of his printing in various records as it applies to record/CD/DVD covers vs the printing used on inserts containing the song lyrics... If you do use a font, can you give us the name of it and whether it was designed off of Neils own handwriting? >>We are making a second edition of Vol. I with the new material and updates we've added so far. What new material? Will all the BD-Live stuff be included? So, Gary .....now I can finally say ....."I knew him when .....!" Ain't that the truth? Love the site that Jesse designed .....sweet. Saw your boxed set of Neil's work ....couldn't afford it, so just drooled. I still have the Deja Vu LP .....great friggin' cover design!